3000 sq.ft fits the whole family! Huge home and large driveway fit the whole family comfortably. Newly Remodeled and professionally redecorated for 2017 season. 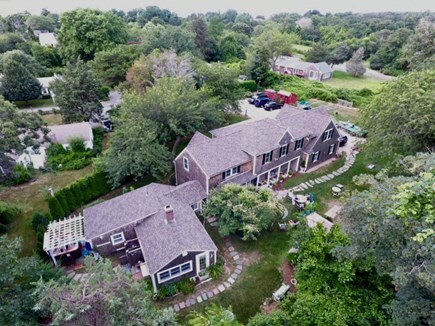 Located on a private, dead-end road, just minutes' walk to Corporation Beach and Dennis Village, this 3000 sq ft. charming Cape/farmhouse is centrally located and the perfect vacation home for your big group to enjoy all Cape Cod has to offer. 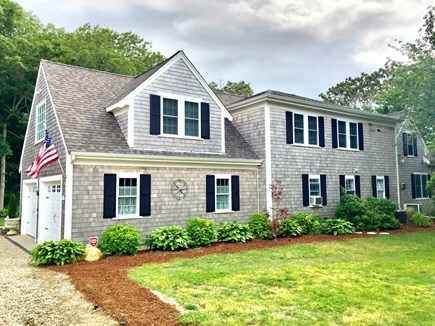 Experience the Charm of Cape Cod Village living in this spacious 5 bedroom 4 bath retreat featuring 2 master suites plus 3 additional bedrooms and bath on the second level. The main floor offers a spacious living room with a gas stove and large flat screen TV, well appointed kitchen with granite counters, breakfast bar that seats 5, a formal dining room that seats up to 8, a cozy den for those looking for quieter moments or to serve as additional sleeping space, plus a full bath and laundry room. 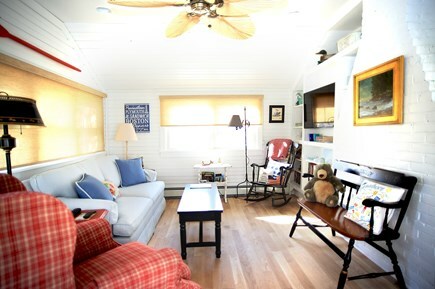 Wifi, Cable TV & DVD player and air conditioned throughout for your comfort. 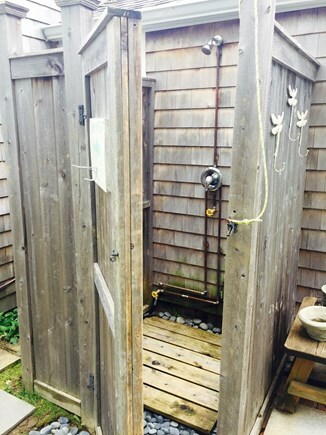 Outside is just as inviting as the interior, offering both privacy and shared spaces. The extra large driveway is big enough to accommodate all your cars and boats. 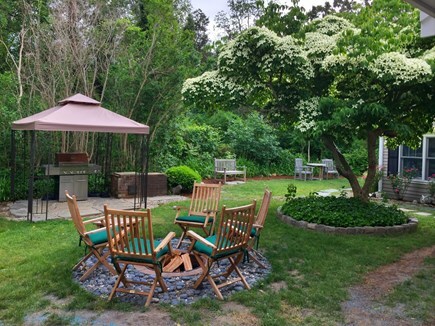 A stone fire pit for evening s'mores, hot tub, outdoor shower, teak tables, sun umbrellas and chairs beg you to lounge and relax. A child swing set and large private yard, plus a driveway big enough to turn & park your boat, means this home has something for everyone. 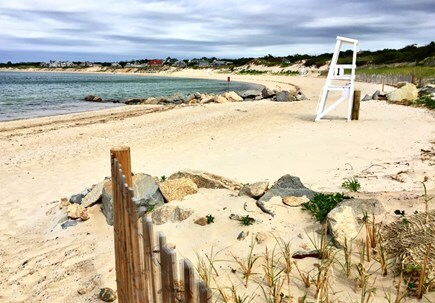 When you're ready for the beach, parking is never an issue with Corporation Beach just .4 mile (10 min walk) down the lane to Dennis' beautiful and family friendly north side. Or take a 1/2 mile stroll the other way in search of adventure or treasure to quaint Dennis Village with its Ice Cream Parlour, Cape Cinema Playhouse, Art Museum and grocery. 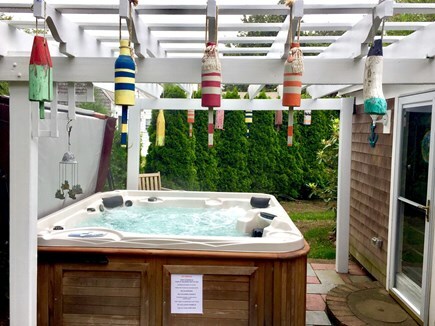 A short drive finds freshwater activities at Scargo Lake, bike rentals & the bike path, golf, Bass River Kayak rentals, and Sesuit Harbor full service Marina. And if the kids want rock-wall climbing or bouncy fun, Cape Cod Inflatable Park is only 8 miles and sure to tucker them out! This is the perfect location for the entire family to enjoy all the Cape has to offer. 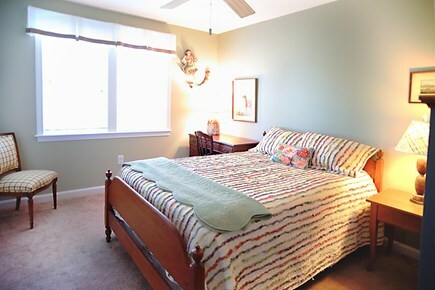 Cleaning fees and bed & bath linens for up to 14 are included. This is a Saturday to Saturday vacation rental. Additional availability info: Flex dates available Sept 1 2019 with 4 night minimum stay. This is a Saturday to Saturday vacation rental. 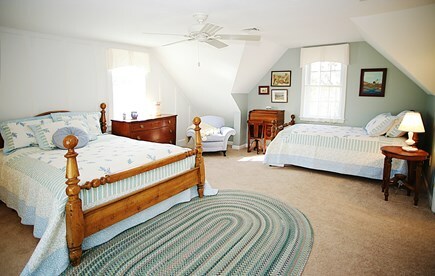 Additional pricing info: Additional state lodging taxes may apply pending MA law. State and local taxes of 12.45% will apply. One of the best in the area for large groups. We have been renting houses in this area for several years and this one is easily one of the best. We had 11 people staying here and there were more than enough bedrooms and beds for all of us. 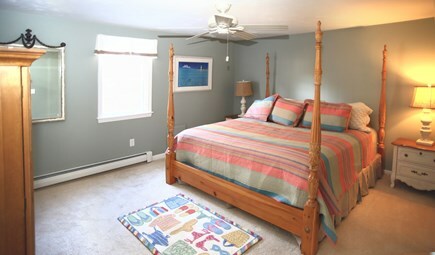 The beds are very comfortable and the air conditioning kept the temperature comfortable too. 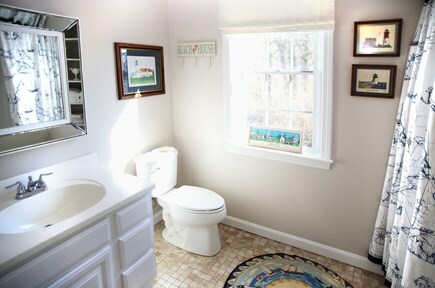 The house spreads out nicely so you can find a quiet place if you need it. 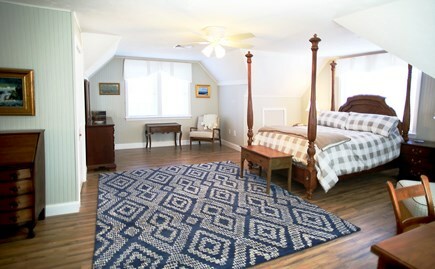 Unlike some other rentals we've had, the linens and bath towels are included in the price and the beds were all made when we got there. At other properties we had to buy a linen package and make all the beds ourselves when we arrived. There is a washer, dryer and dishwasher and the kitchen had everything we needed. The house is a pleasant walk to Corporation Beach which is also a favorite of ours. It has clean convenient bathrooms and a great snack bar for lunch so you don't need to bring food with you. Julie told me the shed was well stocked with chairs, umbrellas and beach toys including boogie boards. We still brought some with us because we've never stayed in a house here that had everything we needed. Turns out she was right, we didn't need to any of our own, there was more in the shed than we needed. The yard is very big and has a swing set which our grandkids did their best to wear out. Outdoor grill, plenty of tables and chairs to sit everyone to eat outdoors. The fire pit and hot tub are great. I'm likely forgetting some things but let me just say this is a great place. 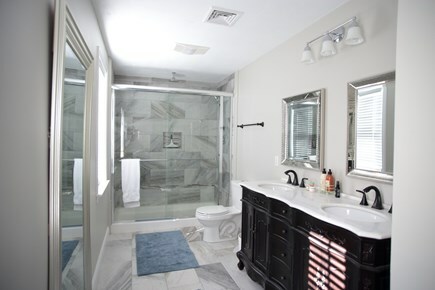 Everything was easy with this house, Julie was great to work with from start to finish. So glad to have had you stay with us this summer! Delighted to hear how well the house and location met your needs and really appreciate your taking the time to write such a wonderful review. Hope very much that you’ll be back! We just returned from staying at this beautiful home on the Cape. Julie is wonderful to work with. The house and property are amazing! Very well maintained home with all the amenities you would need. Corporation Beach is very close and walkable. The kids enjoyed playing with all the beach toys and other toys that were in the house and loved having the swingset on the property! We would definitely stay here again and recommend to others. Thank you for taking the time to leave this wonderful review! We hope you come and stay with us again. We highly recommend this house for family gatherings! We came for the 4th of July week and had a great time. We bought one beach sticker on the way into town at the town hall ($93.00) which allowed grandma and grandpa to park at the beach each morning with umbrellas, chairs, blankets, coolers and toys for our group of 12, allowing all the young families/babies to stroll down at their leisure. The beach is less than a half mile away and an easy walk. 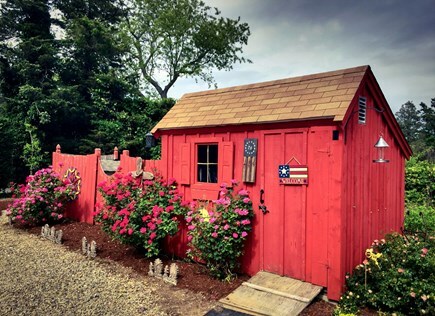 The best news was that their shed is stocked with 4-5 umbrellas, a lot of chairs, wagons and carts to lug the goods, several coolers and lots of kid toys. No need to bring any of these things! The house was set up nicely for families although the stairs couldn't easily be gated so lots of supervised climbing was in order. One of the rooms had a lot of toys in the closet which provided lots of entertainment. Another closet had a baby seat and port-a-crib. We had a campfire each night -- they supply plenty of wood and sticks for marshmallows. So glad you loved the house! We do hope you are able to return! Thank you. We planned a last minute vacation with the intentions of having family come in and stay for the week. Julie the property manager was very helpful with the accommodations. We picked Dennis because my other brother rents a house 5 minutes up the road. During the week we had at different times 8 to 14 family members stay over night and the house and large yard were incredibly accommodating. What the pictures don't show is the large driveway that will easily park 7 to 8 cars. This allowed for my brother's family and a few friends to stop in and enjoy the beach with us for the day. The location of the house allows for you to drop of all off your beach equipment and walk back down to the beach throughout he day without having to pay for parking or wait. The house also had a washer/dryer and all the linens needed for the week. The layout of the interior of the house was perfect for a larger group. The bedrooms were at one end and the kitchen and living area was at the other end. So the people going to bed earlier were not disturbed by the few that stayed up and played games later in the night. We also enjoyed the fire pit and grill set up every day. The back yard layout was large enough for corn hole and it had a swing set for they grand daughter and nieces/nephews. There is also a shed with beach chairs, coolers, wagon. and kids toys for the beach, so since we were flying in from Texas, we were able to enjoy the beach without having to buy anything. We had a few minor issues during the week(smoke detector started chirping, propane tank valve went bad) and the property management company was extremely responsive. They were out and had the repairs completed within a few hours. I could go on and on about the location and the interior decorating of the house, but all I will say that it was the perfect rental. We used the grill and the fire pit, and the kitchen was well-equipped. 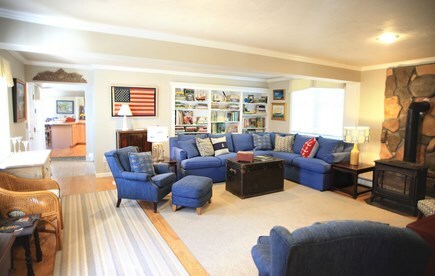 There is also one big living room inside, good for gathering the family for conversation or for watching Red Sox games in the evening. What a pleasure this house was to stay with our extended family - there were no needs unmet from booking to leaving. Julie, the realtor, was fantastic at addressing every detail. House was clean and fresh and location great with an easy walk to the beach. We will definitely be renting again next year!